We clearly remember our first meeting with Two Birds Taco. The Crafty team had just walked into the Royal Exhibition Building for the opening session of the 2013 Great Australasian Beer SpecTAPular and chosen the ten beers we'd put on our first pair of paddles. Nick O returned and declared: "I've changed one of them and gone for Two Birds Taco instead." 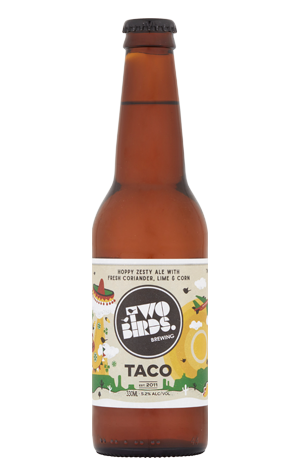 Given it was a beer that seemed to have been brewed as much for the comedy value inherent in the title as anything else – and contained lime, coriander and corn (nachorally) – it wasn't one we'd placed high on the "must do" list. "Jesus. That's the best beer they've made." Whether it is is neither here nor there. What is true is that it's proved so insanely popular that it's now brewed year round (much to the brewers' chagrin given the painstaking effort required to prep all the ingredients). Not only that, it's picked up a gold at the NZ Brewers Guild Awards (where only Kiwis can win trophies) and a gong at the inaugural Craft Beer Awards. It's insanely, zestily refreshing with the lime complementing the Citra and Amarillo hops ridiculously well and the wheat and corn adding a dryness and crispness.